I'm sitting here watching the Tony's tonight and realized I never blogged about the last two Broadway shows that I saw, Vanya and Sonia and Masha and Spike and Roger & Hammerstein's Cinderella. This post is about the former and stayed tuned for next week's "Entertainment Thursday" for the latter. The play is about three siblings (the first three names of the play title). 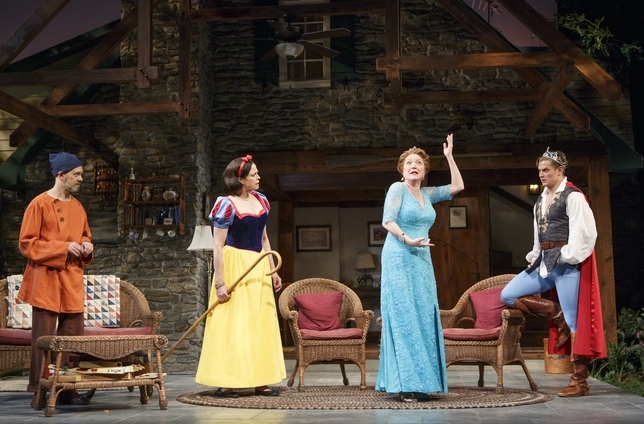 Vanya (David Hyde Pierce) and Sonia (Kristine Nielsen) still live in the Bucks County, PA house in which they grew up. They never quite left their comfort zone unlike their movie star sister Masha (Sigourny Weaver, although I saw her understudy Linda Marie Larson who was also fabulous) who rarely comes to visit. The play takes place over the course of a few days when Masha comes to visit with her boytoy Spike (Billy Magnussen). Other characters include Cassandra (Shalita Grant), the hilarious psychic housekeeper and the starstruck teenage neighbor Nina (Genevieve Angelson) who ends up being enamored by Vanya. Over the course of play all the character's quirks, dysfunctions and personalities are hilariously portrayed in the play which is more like a 2-hr comedy show. There is so much quick dialogue and so much to pick up the script is really impressive. At one point Vanya goes on an impressive 5 minute hysterically delivered ranting diatribe that I was out of breath just listening to. The siblings miraculously grow up over the course of the few days and we (the viewer) feels more comfortable that they will live happily ever after than when the play started. Overall the play is an intelligent and hilarious comedy which I highly recommend. All the actors were top notch. As a side, note, I recently watched the not very good movie That's What She Said in which Kristine Nielsen has a small role, as a prison inmate, to which she brings the same great comedic talent. Has anyone else seen this show? Any other comedy plays that you Shariously recommend? P.S - as I finished writing this post, it just won the Tony for Best Play! Congrats!